Downloadable eBook is available now! What Is The Beanie Babies Price Guide? A foolproof system to show you how to quickly price your beanies for sale! Are you trying to sell your Beanie Babies, but don’t know where to start pricing? Have you tried going through all the hassle of annoying research that ended up going nowhere? That’s why we’re here. Why Our Beanie Babies Price Guide? Simple. Years of market research experience from 3 experts who have been involved with Ty Beanie Babies since the mid 1990’s when the frenzy all began. We know the product inside and out. What makes our guide different? We physically do the research ourselves and use multiple platforms to do so. We spend many, many hours getting it right. We do not use some computer program that pulls prices and then averages them. Those programs get it all wrong. For example, if you are pricing a Chilly it would average the beanie baby, teenie beanie baby, beanie buddy, beanie baby trading card, and even the counterfeits. It would include all conditions like mint, non mint and tagless. This does not give you an accurate portrayal of pricing. Our price guide has sections for each generation and 3 different condition types. The Beanie Babies Price Guide is the simplest and quickest way to value your Ty Beanie Babies and sell them for bigger profits! Learn the hidden secrets that can drastically change the value of your Beanie Babies! The Beanie Babies Price Guide eBook turns hours of painful research into a fast and easy way to sell your Beanie Babies for more money! 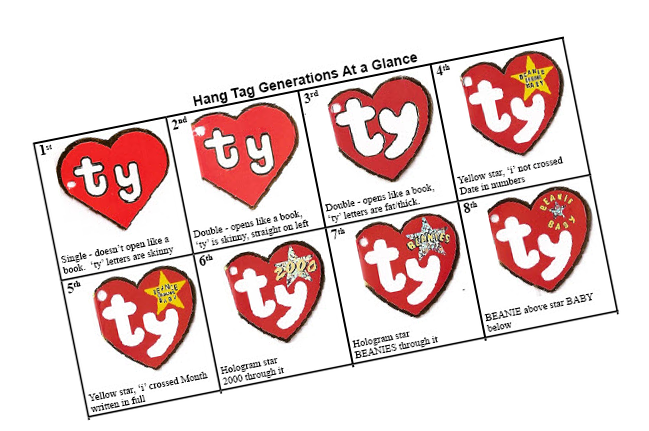 You’ll get a downloadable eBook full of values for every single Beanie Baby hang-tag to date – an incredibly important part of valuing your Beanie Babies! You’ll never have to waste days searching the internet for this info again! Why wait any longer? Get the guide today and sell your Beanie Babies sooner than ever! The Beanie Babies Price Guide covers everything about pricing and selling your Beanie Babies in today’s market.This eBook is for those with Ty Beanie Babies that are looking to sell but have no idea where to start; or for those of you browsing flea markets and thrift stores for low-cost, high-value treasures. This is the perfect eBook for all of your Ty Beanie Baby questions! Sounds great, doesn’t it? So why wait any longer? 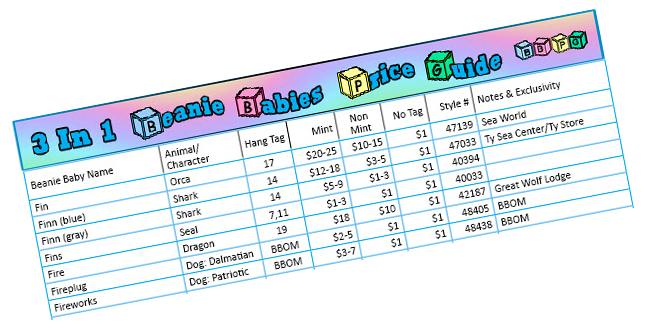 At just $9.95, the Beanie Babies Price Guide is the best investment you can make in increasing your Beanie Baby sales! Not sure what some beanie terms mean? No worries: we’ve even put in a list of collector definitions – you’ll never feel lost as you turn the electronic pages of this priceless resource! Snag your copy of the eBook today! What Powerful Secrets Are Included In The Beanie Babies Price Guide & Website? Info to help you find out which RARE Beanies are in your collection. Beanie terms and lingo so you know what your Beanies are worth. Insider facts on how to quickly determine the condition of your Beanies. Amazingly well-laid out Beanie hang-tag and tush-tag charts that show how they relate to value instantly. Powerful tips on how to build the best collection. Methods to determine the age of your Beanies. Information on the different parts of Beanie Babies and how each part can affect their value. Information on the collector’s value of your Beanies. How to determine if your collection is worth selling or donating. Hints and tricks to avoid getting ripped off when selling or buying. A $50 Value At Only $9.95. Buy The Beanie Babies Price Guide eBook Today! You could have valuable treasures hidden away in your closet, attic, or garage right now as you read this. You could be passing up amazing deals at thrift stores and yard sales every day. For only $9.95, the Beanie Babies Price Guide Downloadable eBook, is an investment in your future profits!